If you are looking for an edge on the local competition for your business, this may be just the opportunity you are looking for. Chris Howell’s carpet and rug dyeing courses are designed to teach you and your business how to develop the dyeing and restoration skills that brought Howell and Colorful Carpets international recognition. This travelling intensive course turns cleaners and restoration professionals into specialists, with the skills that Howell has used in working in the United States White House, Palaces in Dubai, and other prestigious locations around the world. Become a specialist among specialists. Learn more below. Trainee learning how to restore the colors on an intricately-patterned Persian Rug in the airbrushing segment of the dye training. 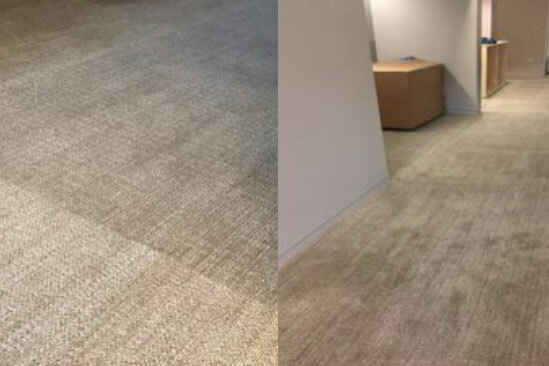 A Colorful Carpets class practices bleach spot repair over and over to ensure their formula is dialed in and they are producing quality results over and over. A team of students get to work on more bleach spill practice, learning from each other's successes and failures along the way. 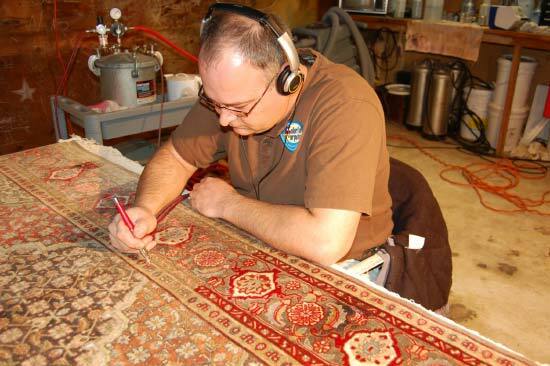 A Colorful Carpets employee demonstrates the meticulous nature and power of rug dye restoration. If you are a veteran, please contact Chris Howell to inquire about our US veteran’s training program. We have a limited number of free slots available. You will need to furnish proof of your past or present military service. Call Chris at (240) 753-5395 or by email at: colorfulcarpets@verizon.net Read more about the program here. What is Carpet Dyeing and Rug Color Restoration? Rug & Carpet Dyeing is the art of restoring color pigments to a carpet or rug after years of wear and tear, color loss from sun fading or a bleaching agent, or adding pigments to change an existing color. Using these dyeing techniques, a specialist can: change the color of someone’s carpet, repair a bleach spill, tackle difficult stains, restore the beauty of hand woven rugs, and even create custom designs. What Will You Learn at a Colorful Carpets Dye Training Course? All Colorful Carpets Dye Training courses are 95% hands-on training. All color matching techniques are taught with the revolutionary ColorCue® App which can be purchased after taking the course! As a business operating in the carpet or rug industry, you probably already get calls from frantic customers asking if you can fix the bleach damage on their carpet or rug from a cleaning product or bleach spill. In most cases you just have to turn away the customer, recommend a repair company, or tell the client that they need to replace their carpet or rug. The Colorful Carpets Dye Training course taught by Chris Howell changes this, eliminating the need of costly replacement and puts money in your pocket. In Colorful Carpets’ training courses you will learn how to neutralize bleach, mix dyes using the ColorCue® app, and apply dye to restore the color of a client’s carpet. 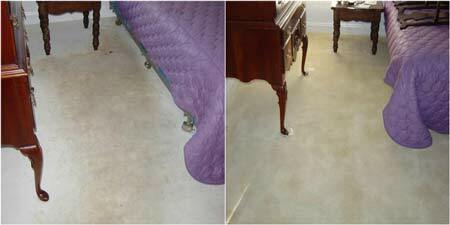 With these skills, you will be able to achieve excellent color matching for repairing damage on carpets or rugs that you service. The pricing for this service is determined by the replacement value of the carpet. Colorful Carpets charges $375.00 per hour for residential color repair services and $900.00 per hour for commercial color repair services. During the 1 day course you will also learn advanced color theory, fiber identification, and color matching techniques. The 3-day course also includes marketing and legal materials, tailored advice, and helpful information on how to run a successful dyeing business. Hand woven rugs are prized possessions of your customers. Years of cleaning and sun exposure often cause these family heirlooms to fade, rendering them unsightly or unusable. In the 3-day Colorful Carpets Dye Training course taught by world-renowned color expert, Chris Howell, you will learn how to restore the color to these beautiful intricately-patterned Persian Rugs using a specialized airbrush system developed by Colorful Carpets for this exciting art. Persian Rug airbrushing is taught on day #3 of our trainings. 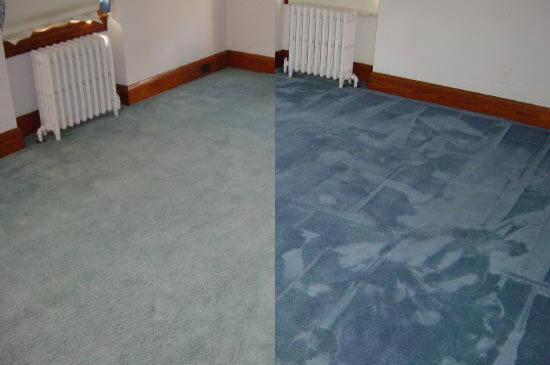 Full room dyeing is a cost-effective alternative to new carpet replacement. This service saves the customer up to 80% as compared to the cost of new carpet. Typically this service is charged at $1.50 – $2.00 per square foot. Full room dyeing is taught on day #2 of our training. A ColorClean® is a service that we’ve been providing in the White House since 2002. It’s a process that’s designed to replace 2% – 3% of the color that fades from every carpet each year from normal use. Basically any carpet that’s over a year old will benefit from a ColorClean®. The ColorClean® can be charged at a higher rate because you are offering an additional service that’s above and beyond a standard cleaning. 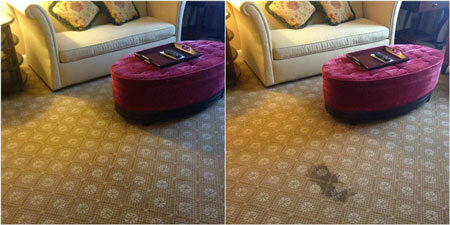 We typically charge $.75 per square foot for our ColorClean® service. The ColorClean® is taught on day #2 of our trainings. Stain removal is tricky for even the best of cleaners. Sometimes the strength of stain remover that is necessary to remove a stain is also strong enough to remove color from a carpet or rug all together. 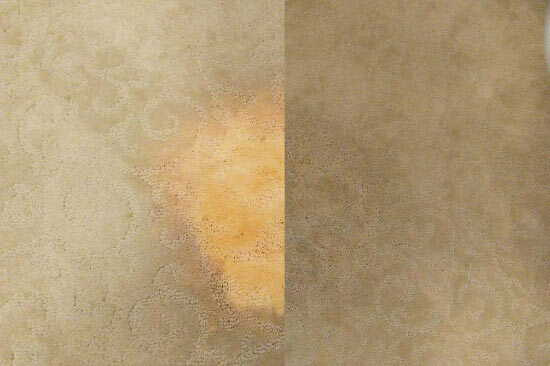 With the bleach spill repair section of the course, you will learn how to restore color to areas that have been bleached from stain removers. This will ensure that you will have an edge on the competition in terms of stain removal! At the 1 or 3-day carpet dyeing and rug restoration course, you will learn how to neutralize bleach, mix dyes to match the color of clients carpet, and apply dye with syringe application techniques to restore the color of a clients carpet. 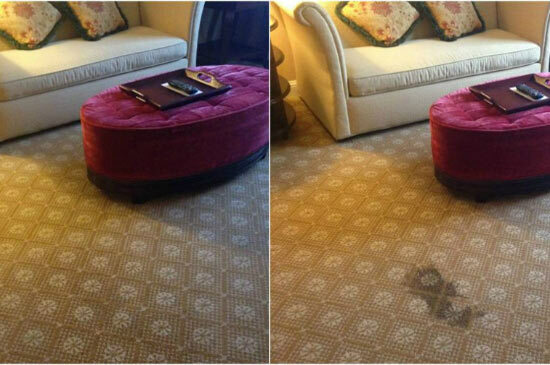 With these skills, you will be able to restore color loss damage on carpets or rugs that you service. 3. Pay to have all carpet that’s been removed hauled out, loaded in a truck, and taken to a landfill (where they have to pay to dispose of it). Also, bear in mind that the carpet is non-biodegradable, so it just “sits” in the landfill. 8. Deal with unhappy dealers and end users for excessive time that was required to resolve the issue and complete the renovation. 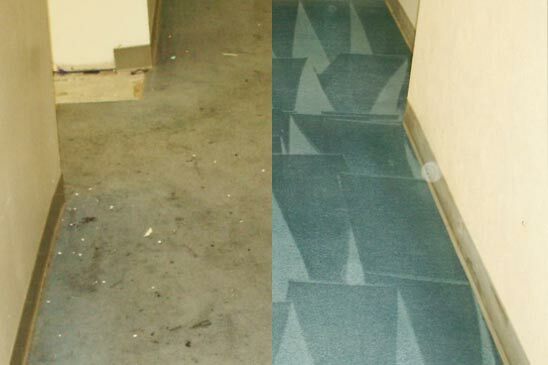 As an alternative to all of this, the manufacturers can get the issue resolved in a timely manner at a fraction of the cost of having to rip out and replace all of the carpet.